Caricature Studio is an image editor which applies novelty effects and distortions to your photos, thereby creating caricatures and generally funny images. It allows you to apply artistic effects or comical elements for virtual postcards, albums, etc. Caricature Studio includes three different ways to apply effects to images: drag a selected area around, create balloons and create twist filters to images. Combining these functions allows for the creation of a funny cartoon. Caricature Studio 6 is a shareware program and can be used as a demo to try the software until the free trial period has ended. A full version of the program is available after the trial period ends. 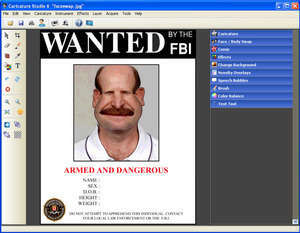 For security reasons, you should also check out the Caricature Studio download at LO4D.com which includes virus and malware tests. Additional screenshots of this application download may be available, too. Caricature Studio has a presence on social networks.